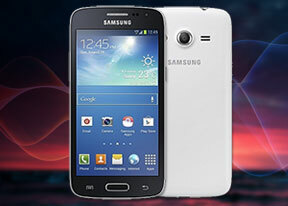 The Samsung Galaxy Core LTE packs a dual-core Cortex-A9 CPU with a maximum frequency of 1.2GHz. There's 1GB of RAM in addition to the Imagination Technologies PowerVR SGX 544MP GPU. That hardware has been around for a while now, so we don't expect to be wowed by its performance. Starting with the BenchmarkPi test, the Galaxy Core manages to score a tad better than the Galaxy S III mini. So far, the Galaxy Core LTE is off to a decent start. Geekbench 3 factors in memory performance Here the Galaxy Core LTE managed to beat the Galaxy Ace 3, which is one of its main rivals, but fell behind the original Galaxy Core. Quadrant is a compound benchmarks, which takes into account not only CPU performance, but also memory and GPU. The Core LTE wasn't too shabby and did just as well as Sony's mid-range Xperia M and Xperia L. It also beat the original Galaxy Core result. And in Antutu, another compound benchmark, the modest chipset was able to shoot the Galaxy Core LTE ahead of the HTC One mini, which was a pleasant surprise. Time to put the Galaxy Core LTE PowerVR SGX 544MP GPU to a test. We ran the GFXBench T-Rex in 1080p offscreen mode. The meager 2.6fps is markedly unimpressive, but chances are it will never have to face 1080p screens in real life. For a more accurate representation of the Galxy Core LTE real-life graphics prowess we stepped back to NenaMark 2. It managed to score 53.1fps in the on-screen test placing itself right below the HTC Desire 700 and beating all of its brethren such as the Galaxy Ace 3 and the Galaxy Grand Neo. The Samsung Galaxy Core LTE may pack an outdated dual-core CPU, but it managed to punch above its weight in many of the tests here. It doesn't set any benchmarks on fire, of course, but it's not a disastrous performer either. And while the entry-level competitors that have moved to quad-core chipsets by MediaTek can comfortably outperform it, they can't match the 4G connectivity which is probably the reason you are checking the Galaxy Core LTE in the first place.